Gymnastics on Trampolines - Trampoline for Me! A couple of us were really fascinated by gymnastics when we were kids. Not all of us could experience performing, jumping, doing flips and other “extreme” stuff gymnasts do (well, a regular flip is hardly extreme, but a double or triple flip…). Why would that stop us? Whether it is for impressing women, for our own amusement, the thrill of it or something else (learning to do a flip so you could do it while skydiving for example), all the jumping gymnasts do are easier to learn if you start on the trampoline. That is even how gymnasts start – along with the sponge pit and some other equipment that we’re not reviewing here. Back in the day I did some gymnastics – and I wanted to progress rapidly. 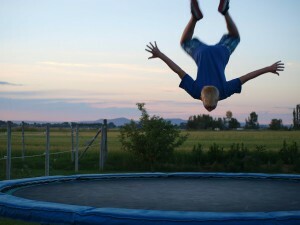 So I started jumping on my trampoline – practicing backflips for as long as I could. My skill increased dramatically and I learned a lot of the tricks in a very short time! That is the power of this way of training. 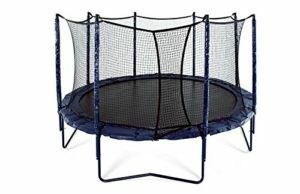 So you’re on the look to peek into the world of gymnastics by buying/owning a trampoline? 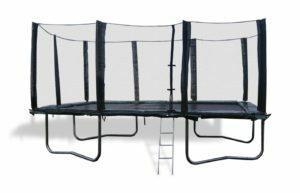 There are a couple of factors that could help you choose the best home trampoline for gymnastics or the best outdoor trampoline for gymnastics, depending on where you wish to place it. One of the most notable criteria is jumping potential and size (especially for indoor usage). I do not recommend indoor usage for a couple of obvious reasons. While you can certainly place a jumping mat for kids indoors, if you wish to have a really good bounce you should probably move it outside as those are bigger and hey, you can actually break something if you jump too high, right? That being said, I will give you an option if you want to follow this route. If you’re on the look for the trampoline like they have them in the jumping parks, those are considered as professional and you can’t really buy them anywhere you’d like as regular consumer stores don’t sell them. Plus, you need a whole bunch of equipment, so I won’t be dwelling into that here. Maybe, later on, I’ll write a page about that. Here we will discuss what makes trampoline good for gymnastics, as well as give an overview of my recommended best home and outdoor trampolines for gymnastics. Bear in mind that performing gymnastics can be dangerous and you’re doing it at your own risk – don’t say later I didn’t warn you. This is an all-American made one. The first thing you’ll notice is that it comes with safety enclosure as well as the ladder. It focuses on the quality of the jumping surface and the springs, which is why it can be qualified as olympic. The springs (108 springs of Super heavy duty) that are used are of bigger diameter (9” long, 33% longer than competitors) and higher quality than most of the competitors. What does that mean? Well, for starters, you’re sure that you won’t fall through. Second, the bounce you can get with this trampoline is BIG. I mean, it is really big. True olympic style. The Patented Stay-put enclosure net is made of tough, high-grade polyester mesh. It has 4 legs heavy duty Stabilizer Frame that boasts a 3.0 mm thick “commercial grade quality” steel tubing galvanized inside and out. But let’s be clear on one thing: this is absolutely made for both experts and beginners. The jumping mat is 40 inches high, the bounce is great, there are enclosure set and the ladder. What else do you need?! The weight limit is 550 pounds, which is to say that one person can be really aggressive, but you can jump for enjoyment as well. All of the materials used are made for outdoors usage. Everything is rust resistant, or weather resistant, or UV resistant, or everything of the above. I’d still cover it though, as it is quite expensive so just to be on the safe side. Assembling isn’t really hard. Click here to view Happy Trampoline 10×17 on Amazon! Well, would you mind me telling you that this has a 15 years warranty on its frame? I know that really caught my attention. I’m used to products which break a few days after the warranty expires. But for this one, even if it is the case, that still 15 years! And if you plan on using it that whole time and you finance yourself like a bank, you’ll realize that you can get this trampoline for as little as 10$ a month, which is insane! Ok, so this is a little smaller. So why is it here on the list? 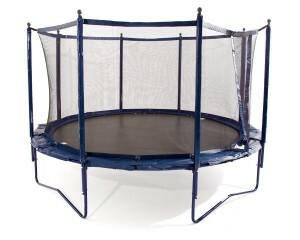 Because I’d recommend going with this one as the best home trampoline for gymnastics. Mainly because of the size. First of all, let’s talk about the weight limit. On the box, it says that it is a 175 pounds max and although I tend to take these precautions very seriously, I managed to find out that it can hold about 200 pounds. I wouldn’t go above it. If you decide to bring it inside, be sure to wrap some paddings around the legs of the trampoline – the shock from jumping can really damage your floor and you probably don’t want that, right? Oh, and bear in mind that you can jump a little higher with this, so try not to jump too high while you’re inside. I’m telling this because we don’t use safety net when we use our trampolines inside – and that can simply put, break some stuff around.